If you’ve ever been to Las Vegas then you probably won’t be surprised to hear the place is stalked by the undead. 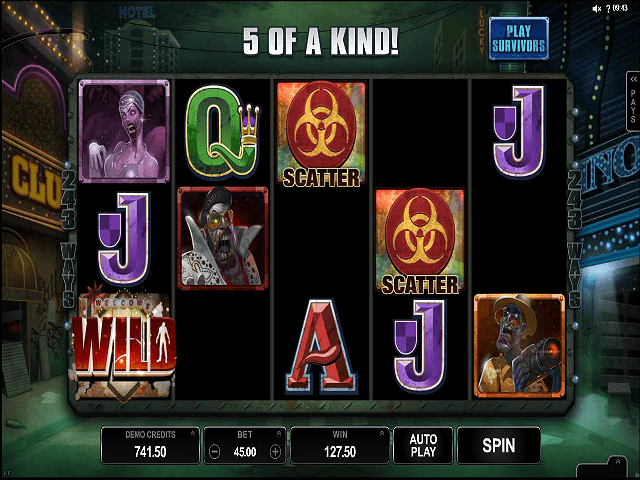 In this enjoyable 3D slot from Microgaming though, it’s genuine flesh-eating, apocalypse-type zombies that are causing havoc in and around Sin City’s most iconic sights. Play Lost Vegas for Real Money! 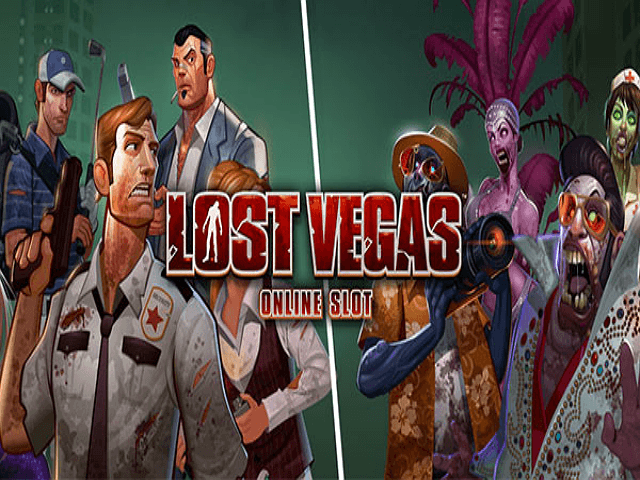 The Lost Vegas online slot from Microgaming is a fun, five-reel offering with two base-game features, two free-spins rounds and 243 ways to win. It also, rather excitedly, allows you to play the game in two different modes: Survivor and Zombie – from 30p to £45 per spin. The former lets you play from the point of view of heroic humans trying to escape the zombies while the latter sees you handling things from the flesh-eaters’ side. If you think you’re not getting much luck in one mode (or you just feel like a change of scenery) then you can switch to the other mode whenever you like by pressing the button at the top of the screen. This cool innovation helps to keep the gameplay feeling fresh (or rotten). Lost Vegas benefits from gorgeous graphics and a dark comedic edge. 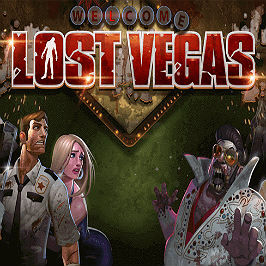 Superbly animated cartoon-style visuals give the game a lively and dynamic cinematic theme, while the brooding downtown Vegas background evokes a feeling of peril. The way the visuals change between modes is refreshingly impressive too; watching the slot symbols transform from your typical Hollywood survivor heroes to zombified versions of classic Las Vegas characters (like Elvis and a hastily married couple) is a blast. Survivor Mode - Essentially a round of endless spins, plus each time a 10, J, Q, K or A lands on the reels it gets removed for a payout. The round ends when they’ve all been removed. Zombie Mode - Stacked zombies infect other reels, turning wilds into stacked wilds. The round ends when all reels are infected or 50 spins are played. Playing 50 spins rewards an additional prize. Other feature rounds include the Zombie Fist of Cash (basically a random Zombie fist punching out of the screen with a fist full of cash) and the Blackout Bonus (another random event whereby the screen blacks out to reveal all the high paying symbols). There’s no doubting the Lost Vegas slot machine is an easy one to fall for. 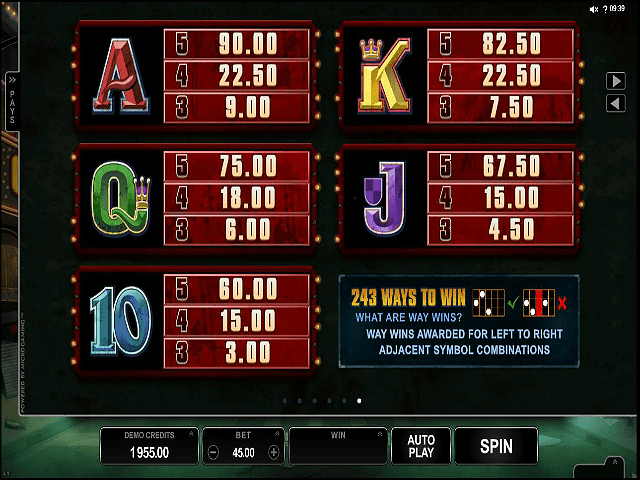 For sure, the slick graphics and 243 ways to win are big draws by themselves. However, it’s perhaps the whole ‘two modes to choose from’ innovation which is the most potent source of the game’s appeal. Being able to switch things up whenever you like is great and adds much to what is already a highly enjoyable game in itself. Share this Lost Vegas Review today! 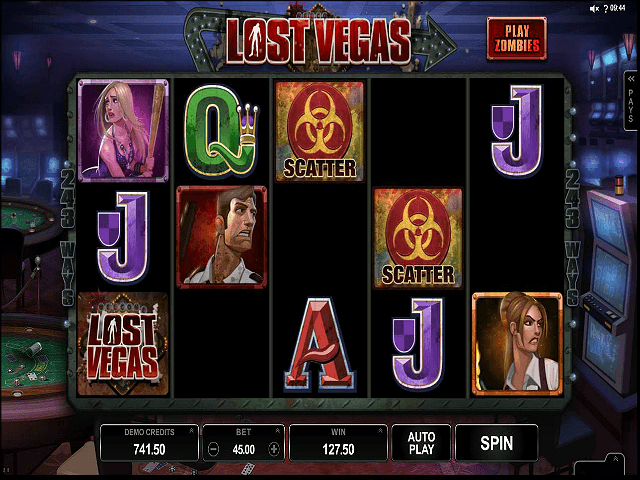 If you like Lost Vegas, you'll love these slot titles too!